Now that Google Voice and Hangouts have merged, we are starting to dive in and see how things have changed and if new features have been added. The first thing we tested was sending a text through Hangouts using our Google Voice number. After that went through just fine, it was time to see how MMS messages work. For those new, Google Voice has never really built-in MMS (multimedia messages) capabilities, outside of a carrier partnership here or there that allowed them to arrive as emails. In today’s update, though, MMS is fully working, though it is still a bit different than a normal MMS message. As you can see in the series of screenshots at the top, I sent a screenshot (.png) file from my phone with the new Hangouts app over to a number using the old Hangouts app. The image shows that it sent as it normally would if I were in a Hangouts message, only it did so via “SMS.” On the recipient end, you can see that the image arrived as a URL that can be clicked for viewing. So yep, MMS or multimedia messages do indeed work, Google is just uploading them at some point in the process and then sharing them as a URL to the person on the other end of your conversation. To see this kind of integration, you have to officially “migrate” your Google Voice with Hangouts. 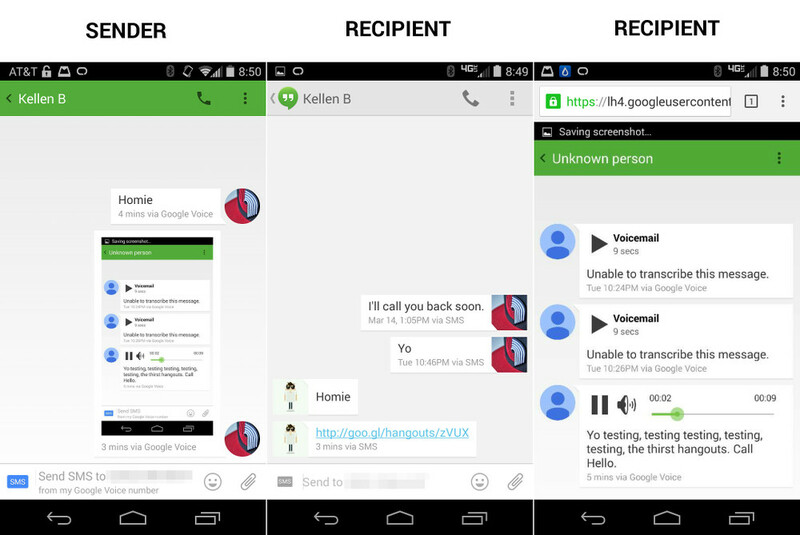 To grab the new Hangouts v2.3 .apk, hit up this post. Update: Here is how to setup your voicemails to show in Hangouts and also not see double notifications.